Boxee plans to announce a new device dubbed Boxee TV Tuesday that aims to combine over-the-air broadcast content with a cloud DVR and streaming services like Netflix (s NFLX) and Vudu (s WMT). Boxee TV will allow consumers to record two shows at a time, and upload each and every recording to the cloud, where it will offer unlimited storage for recorded shows. The new product is a big step for Boxee, whose Boxee Box device never managed to attract an audience beyond early adopters. “This is no longer for geeks by geeks,” Boxee CEO Avner Ronen told me during a recent phone conversation. 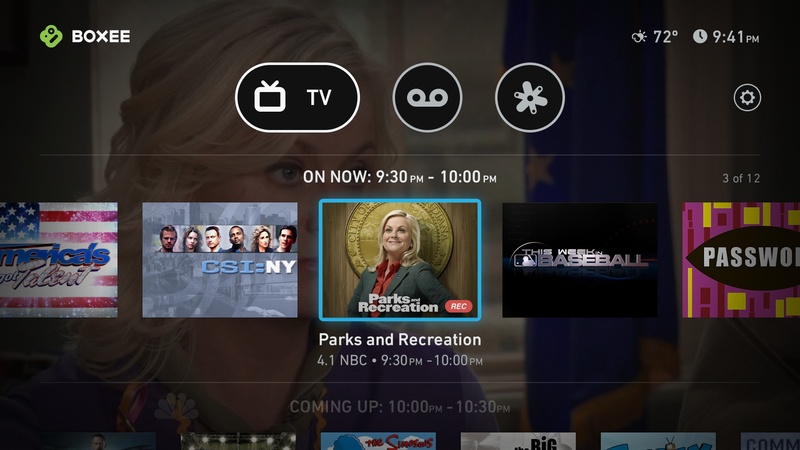 Boxee’s new UI focuses squarely on TV content. Boxee TV will go on sale for $99 on November 1. 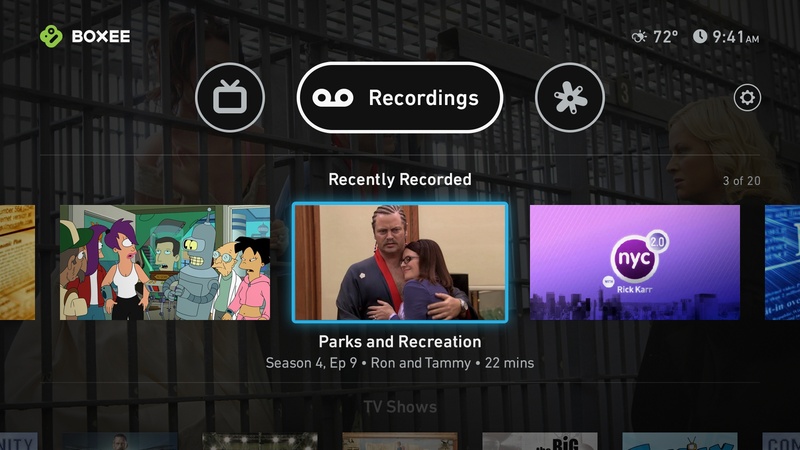 The cloud DVR service will cost consumers an additional $15, which is only slightly cheaper than a month-to-month TiVo (s TIVO) subscription, but Boxee hopes to make up for it with added features. Recordings stored in the cloud will be available for streaming both on Boxee TV as well as on any device with a web browser, including iPads (s AAPL) and mobile phones. Native apps for Android (S GOOG) and iOS will launch at a later time, said Ronen. Boxee will roll out the DVR service in New York City, Los Angeles, Chicago, Dallas, Houston, Atlanta, Philadelphia and D.C first, with Ronen telling me that the company wants to make sure that the cloud DVR infrastructure can scale up to the challenge. A launch in additional markets is planed for 2013. 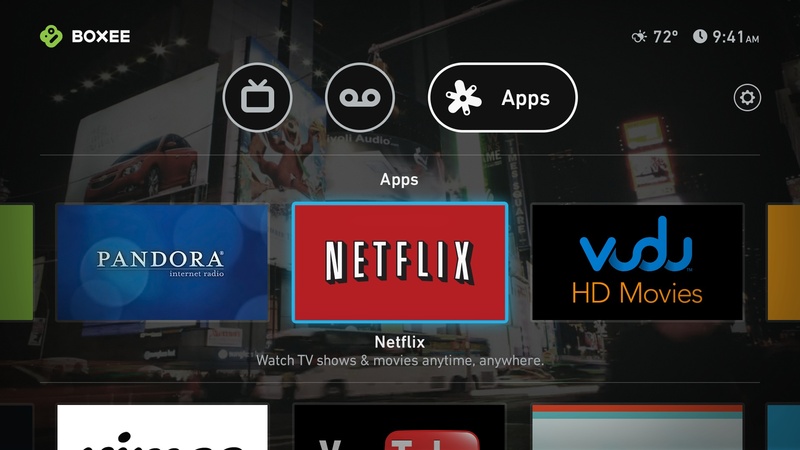 The new Boxee TV device will come with a limited number of apps, which will include Netflix, Vudu, YouTube, (S GOOG) Vimeo and Pandora. (s P) However, many of the apps available on the existing Boxee Box won’t make it onto the new device. “We don’t believe that the user experience gets better with a thousand apps,” Ronen told me. Boxee TV will come with a limited number of apps. Boxee also completely rebuilt its software from the ground up, ditching the code base of the XBMC open source project and replacing it with a customized embedded Linux solution. “It was very liberating for us,” Ronen said about this step. The introduction of the new device means that Boxee will put the original Boxee Box in maintenance mode, with Ronen telling me that the company won’t be rolling out any major firmware updates for it anymore. That likely won’t go over well with Boxee’s small but very vocal base of early adopters. Boxee TV will offer unlimited recording space in the cloud. Ronen said that the company will soon announce a kind of loyalty offer for existing users who are willing to switch over to the new platform, but he also didn’t make a secret out of the fact that Boxee TV is meant to target a different and potentially much larger user base. “When you start a company, you want to solve a problem for yourself,” said Ronen. Now, Boxee was out to solve a problem for mainstream consumers ready to cut the cord, and generate revenue for the first time in its history, he added. Boxee’s cloud DVR subscription service comes at a time when there’s a bit of a comeback for over-the-air, in part because consumers have been running into restrictions with some over-the-top content. Shows like American idol still aren’t available as full episodes online, but can be viewed for free and in HD via over-the-air broadcast feeds. A number of companies is looking to capitalize on those feeds and combine them with streaming and online apps. New York-based Aereo has been sued for its offering, and Simple.tv launched its DVR for cord cutters earlier this week. I heard that Boxee TV was supposed to be able to unscramble local channels for local channels via an existing cable line. Does that still hold true? I know the FCC caved and allowed cable companies to scramble local channels, so does this mean people will have to pay the cable company for their local channels now? Is the Boxee TV only able to use OTA? Dont let Boxee foul you. Just see what they did with the Boxee Box. That product never worked like it should, and now they dropped all those people who supported them. Sounds like a(nother) stopgap product to me. Boxee have pinched bits from their decode/player software, boxee box, tuner dongle & cloudee app & lumped it all together into one (dull looking & decidedly un-innovative) $99 black box. Sounds to me like they have realised the boxee box spec & feature set was too much of a reach for them. This is absolutely the case (ask 90% of boxee box users). 1) This product is Boxee’s last gasp attempt to milk some revenue from the product lines they have already developed, in order to pay off investors before disappearing in a puff of smoke. 2) This product is a “safe” stopgap to appease the rightly hacked-off boxee box community, and gain some market traction before emerging at some point in the future with a new all-singing-all-dancing boxee box. The product they should have made in the first place. To be fair, they *did* make the product in the first place… almost. The published spec proved to be unachievable in the real world, and they badly underestimated the resources needed to support their product, for even a tiny user base. The result of which was a “vocal” user base, all of whom feel utterly conned & mistreated by this company who promised so much and singularly failed to deliver. Avner Ronen – Ditching XBMC “was very liberating for usâ€. Really? Extreme irony, given XBMC was the one piece of the Boxee jigsaw which actually worked. And XBMC has a very active & extensive multi-platform dev & user community, which Boxee proved woefully incapable of leveraging & integrating with. Avner Ronen is a politician & spin doctor extraordinaire. Big pinch of salt when you read any of his promises and assurances people. Don’t give Boxee any money you aren’t prepared to write off before you start. If you have a Boxee Box and like it, you may want to run out and buy a replacement remote or two while they’re still available. They won’t be available soon as they are being discontinued along with the Boxee Box. If you are looking for a replacement box (or additional box), the next best thing is the WD TV Live (or the WD TV Live Hub for those who want storage). Boxee Box = stream pretty well anything; watch pretty well anything on demand. Boxee TV = less apps; less streaming options; more dependent on broadcast content. Selling point of Boxee TV = unlimited DVR. Who cares about DVR when you can watch pretty well anything online on demand? DVR… you may as well make it a DVD player too, LOL. I was thinking of getting a second Boxee Box for my rec room. I guess I’ll be getting a WD TV Live instead. The Boxee TV falls short in many regards compared to the Boxee Box. The new Boxee TV will have much less in terms of apps, and will not have a web browser app. The remote control for the new device will not have the full QWERTY keyboard and will not be an RF remote, both of which were nice differentiators for the Boxee Box. The layout of the new Boxee TV will also be very different from the Boxee Box, so the TV and Movie Libraries won’t be there like they are now. Overall, this new device sounds like a huge disappointment for Boxee enthusiasts like myself. If you use two boxes do you have to pay 30.00/month or can the different boxes share the same account ? So, if someone wanted to keep track of a local TV station’s news reporting, could they record every OTA single nightly news broadcast from that station to the cloud, forever? So glad I live in the UK! I can buy a DVR without a contract, And the BBC, ITV and Channel 4 heck even Sky store there own content in the cloud. Boxee has lost all my respect, a device like this is not needed in Europe but they took my money form the original box then killed it and developed something that wont work outside of the USA. Jokers! …Right after they remove more content or apps for this new boxee, seems like a fail whale!!! -Now screwing the original Boxee Box users. Putting a Box in Maintenance mode that is still being sold in large retailers. -They have no clue on keeping a user base happy and basically alienate them by silence. If you interested at the reaction or Rebellion 2.0, read the comments on their blog announcement or take a visit to the forum. It’s the “Digg” effect, and I’m talking about when Digg alienated their entire user base. Smart : You receiceve OTA hd @ 19.2/s, recording in native format. At the same time boxee records in the cloud, what you record, same HD can be in MPEG-4 as low as 5M/s for boxee and 2M/s for iPad. If single copy per user, then this is covered by cable vision ruling. So legal. Why would anyone trust Boxee? Look into their track record they didn’t deliver half of what they promised with the original box. Now they come out with another box of promises. STAY AWAY! I’ve had a Boxee for a couple years, and while the lack of support for mobile flash has certainly been an issue, it’s Netflix and Navi-X that really makes the unit worthwhile. Moving forward, smart TVs provide much of the service Boxee already delivers. If app support goes away, it has nothing to offer. Wow, I really don’t get this. Am I really going to pay $15/month for an OTA-only DVR? If I’m willing to pay that, I’m probably interested in far more content than just available over-the-air, at which point I’m likely going to have cable or satellite service, in which case this box becomes purely redundant. And it looks like an abysmal OTT box, with very few services and a proprietary platform unlikely to be well-supported in the future. Boxee seems to be flailing, throwing everything against the wall and hoping something sticks, but there’s just nothing here even remotely compelling. Agreed! They seem rather directionless. Why abandon a product that had superior functionality compared to competing products to launch a less functional device more heavily reliant on broadcast content? The real problem with the Boxee Box was not the device, but the lack of marketing. Most consumers had never heard of the Boxee Box, let alone know what it did/does. The company would have more success if they focused on marketing to create awareness for the Boxee Box and expand adoption while figuring out a recurring revenue stream. With Boxee TV can I PPV to stream a single NFL game of my choice? Unlimited storage? Really? Are they using one recording of a show to serve all customers? I’m with you on that. Got to have Amazon! OTA TV? so like network channels in HD? Too bad Denver is never in any of these tech launch markets. We like new gadgets (and cloud DVR service) here too! I own a boxee box. This announcement is horsesh*t. No more firmware updates? And why would I want to move to a different model with less variety and functionality? Once again, the customer loses because a company is trying to “innovate” for $$$ and not user experience. Amazon app? Really? Who uses that? Who uses Amazon? Really Stewart? I use it, and I’m not the only one. Do you know they have a service like Netflix that is cheaper and also includes free 2 day shipping on Amazon purchases? I actually used their on demand service years ago and was not very intuitive. It was pretty clunky. I’m sure it’s much better now, but I don’t see the connection between paying for a full year of prime when I can basically turn Netflix on and off (at $7.99 a pop) at will. And they also have tons of indie, documentary and educational films that amazon does not. Netflix continues to innovate in that way, where amazon is only concerned with what’s popular. People have been catching on with Netflix though and more will realize that media players such as boxee are set to become the norm. I can watch ANYTHING on my boxee. Yes, even HBO. It’s amazing what open source can give you. Just because you don’t use Amazon doesn’t mean anything! The current box will not just stop working, I have and have bought several Boxee Boxes for others. It’s unfortunate that the Boxee TV will have less features then the current box, but it may be able to be used as a companion box. We’ll just have to see what the next Boxee Box firmware update brings and what the new box does. I personally don’t use Amazon VOD much, but access it using PlayOn/PlayLater though my Boxee Boxes. I wouldn’t count on many more firmware updates for the Boxee Box. Is your Boxee Box going to suddenly stop working? Was a promise of lifetime firmware updates promised to you when you purchased it? Would you rather see Boxee fold, their employees laid off and no further products ever released because they didn’t pursue a revenue-generating opportunity? So how would this work? Do you need 15Mbps upstream bandwidth to record an MPEG-2 HD OTA program in the cloud? Or is Boxee doing the recording themselves and then making it available? They’re going to compress it locally, then upload it. I haven’t seen it working, so I can’t say how instantaneous that experience is. I wouldn’t think you would need anymore bandwidth then if you’re using Netflix, VUDU or Hulu. This sounds too good to be true. UNLIMITED DVR? REALLY? Fail! When is a company going to make a DVR that does not come with absurd monthly fee! The TV guide info is free or nothing to these companies! Vulkano from Monsoon Multimedia has it. With that box you can watch your home life TV every where (through internet) and record any TV shows with a bild in DVR. You pay once about $99 for the box and once for the App download on tablets or smart phone $12 (on PC the Player is free). Thats all, about $ 112 and no more payments. Why not just have the broadcasters store their own terrestrial feeds in the cloud and give users access like in the UK? This seems doomed if users have to save a copy, upload it, then download it again. So when it’s reported that they will have “…over-the-air broadcast content…”, does that mean the ability to plug in an OTA antenna for DVR service, or that one can access live OTA content via the internet through the box? Plug in an antenna. The device apparently gets sold with a basic antenna. I’m curious about the quality of the OTA picture being routed through the box. I don’t own a Boxee Box but I know it has an adapter. I thought I read that the picture isn’t as great compared to a straight feed from antenna to TV. Also, what quality will the DVR’d vids be stored to their cloud service? The review of simple.tv (thanks Janko!) said the quality was suspect. They told me they’re gonna stream 1080p from their cloud DVR. Not sure about the bitrate though.